Irritable bowel syndrome (IBS) is known as a functional gastrointestinal disorder, meaning that is diagnosed based on having a set of symptoms over time affecting the movement of the gastrointestinal tract rather than a specific type of damage to the gastrointestinal tract. The cause of irritable bowel syndrome is not well understood. Symptoms and signs of irritable bowel syndrome can include diarrhea, changes in bowel habits, constipation, gas, bloating, abdominal pain or cramping, and food intolerance. Other associated symptoms can be abdominal swelling, nausea, loss of appetite, weight loss, loose stools, straining to have a bowel movement, and the presence of mucous in the stool or foamy-appearing stool. The specific symptoms depend on the type of IBS that is present, whether constipation or diarrhea is the predominant feature. Antispasmodic medicines, such as dicyclomine (Bemote, Bentyl, Di-Spaz) and hyoscyamine (Levsin, Levbid, NuLev), are sometimes used to treat symptoms of irritable bowel syndrome. Antispasmodic medicines help slow the movements of the digestive tract and reduce the chance of spasms. They may have side effects and are not for everyone. Other treatment plans are available, depending on the symptoms and condition. Antidiarrheal medicines, such as loperamide (Imodium), a kaolin/pectin preparation (Kaopectate), and diphenoxylate/atropine (Lomotil), are sometimes used when diarrhea is a major feature of IBS. Do not take these on a long-term basis without first consulting a doctor. Antidepressants may be very effective in smaller doses than those typically used to treat depression. Imipramine (Tofranil), amitriptyline (Elavil), nortriptyline (Pamelor), and desipramine (Norpramin) are some commonly used medicines that may alleviate irritable bowel syndrome symptoms. Some other antidepressants are more commonly prescribed when depression and IBS coexist. Smoking may worsen symptoms of IBS, which is another good reason to quit. Low fat and high carbohydrate meals such as pasta, rice, and whole grain bread may help IBS symptoms (unless the person has celiac disease). 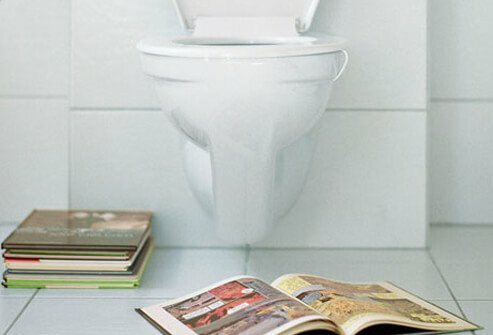 Those who mostly have diarrhea as a symptom are considered to have IBS with diarrhea (IBS-D), characterized by sudden urges to have bowel movements, along with loose stools, frequent stools, abdominal pain and discomfort, gas, and the feeling of being unable to completely empty the bowels. In severe cases of IBS-D, individuals may lose control of their bowels.